Friends, I have to say, this is one of my favorite posts I do all year. 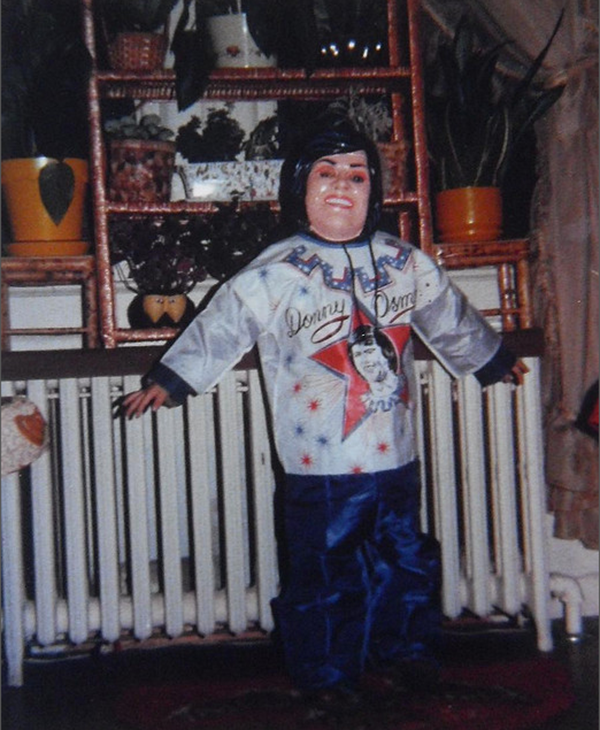 It started back a few year’s ago when I went to one of those Halloween Super Stores and ended up getting totally freaked out by all the ultra creepy masks. Is this what halloween is all about now? Rotting zombies? 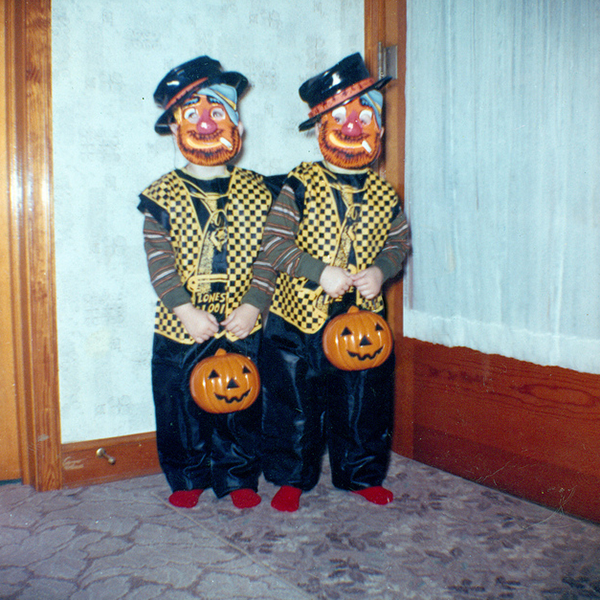 Psycho clowns? That lame Scream ghost?? I remembering shaking my head and thinking, “Man, it’s not like back in the day. 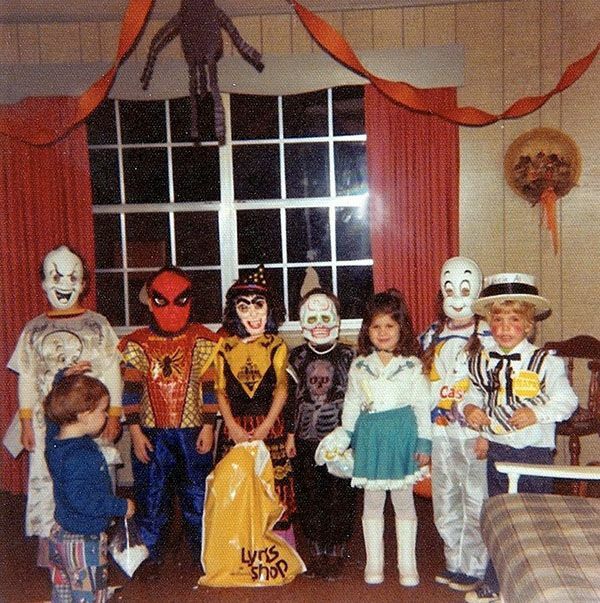 Costumes were so much cuter back then!” But then as I started looking for old photos I had the realization that while many of those old plastic mask costumes were under the guise of innocent characters, most of them were totally creepy. Creepy cool. Let’s take a look! 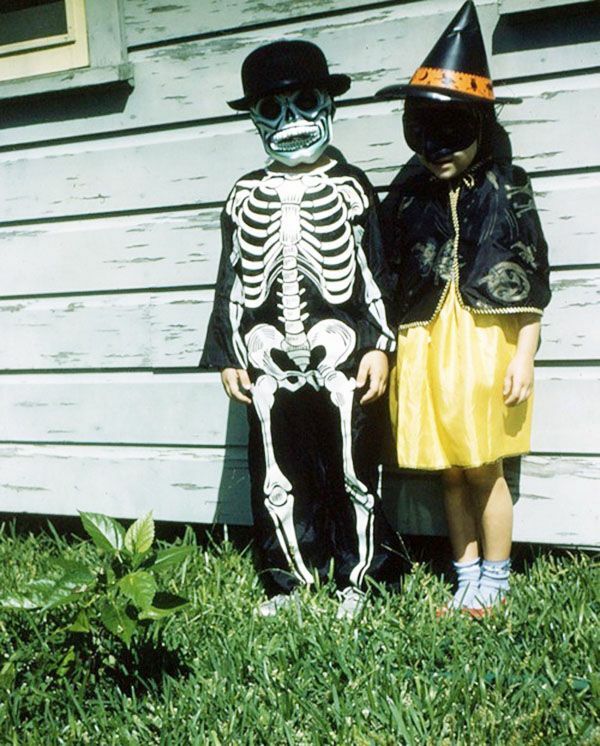 We begin with this grim duo….the jaunty bowler and capelet are a nice try at “cute-ing” this pair, up….but don’t think we didn’t notice that your face was green, little witchie poo. Ahhh, the Creature of the Black Lagoon! Lurker of murky swamps….and fan of Revlon’s Racy Red lipstick. It’s very drag-tastic, no? 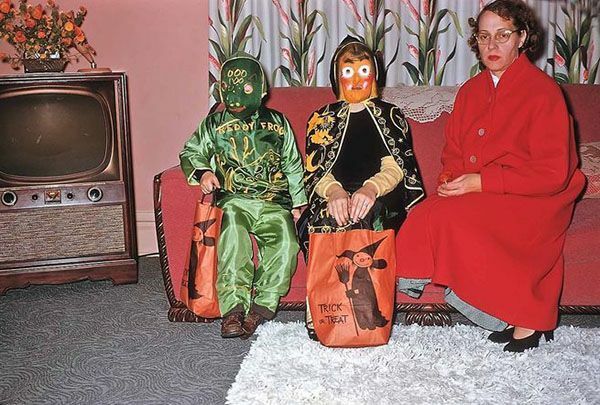 Hmmm, I’m not sure what’s scarier….Freddy Frog and the Startled Pumpkin….or the grim face of that lady. (You KNOW she just hissed at them to “Sit up straight for the photo!”) Even the TV looks shocked. 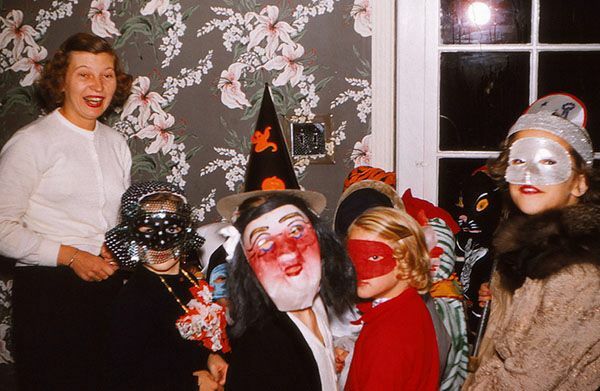 When I find vintage Halloween photos I typically put them into one of two folders: “Cute Vintage Halloween” and “Creepy Vintage Halloween”. This darling group almost made it into the Cute folder. 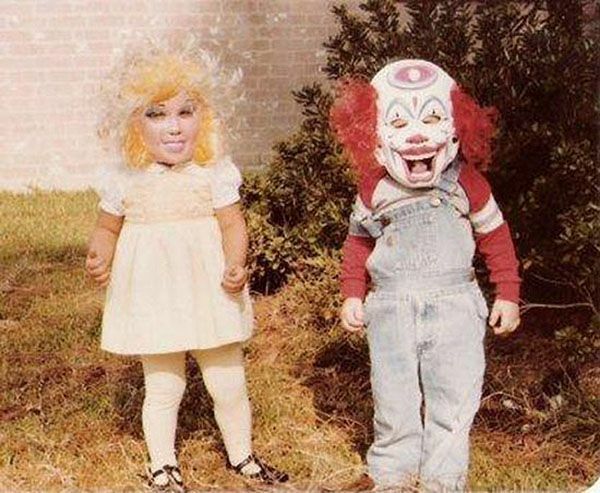 One guess who bumped them into Creepy…. This group is a plastic delight. 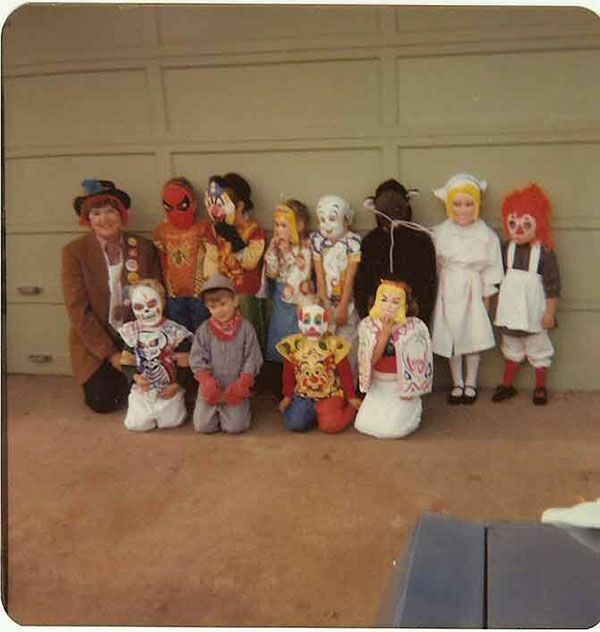 Nervous clown, defiant skeleton, queen who has a twin sister that’s a nurse, and crazy Raggedy Ann on the end there. Someone needs a hot oil treatment. Hee. 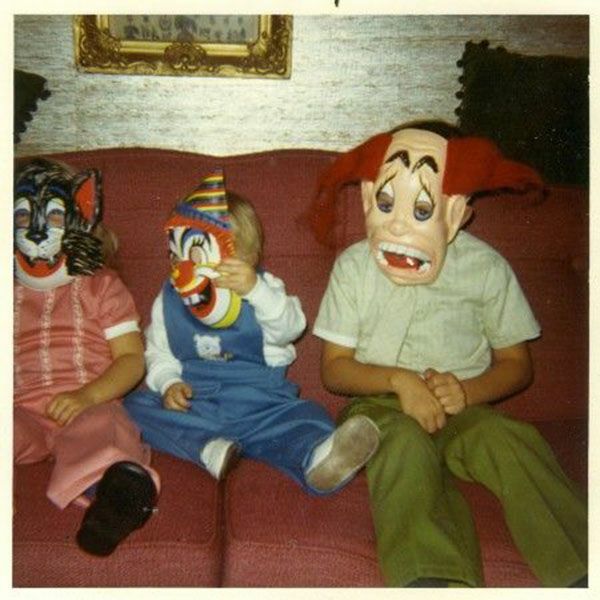 I love the Banana Splits guy and even that lil devil is kinda cute. The witch is where we all fall apart. (Does it say Super Witch on her costume??) 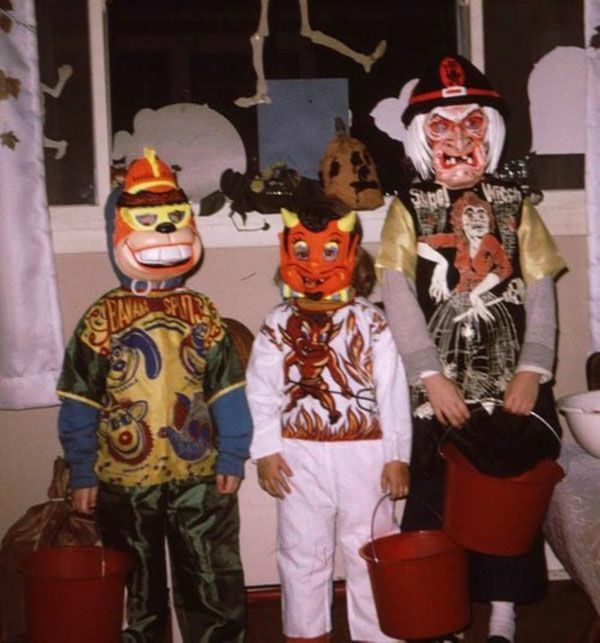 Please note the GIGANTIC buckets they are planning on collecting candy with. If one smoking bum is cool, then two are twice as nice! Bonus points for dainty candy containers. Not like those greedy bums above. These two crack me up….they look sooooooo over it all. 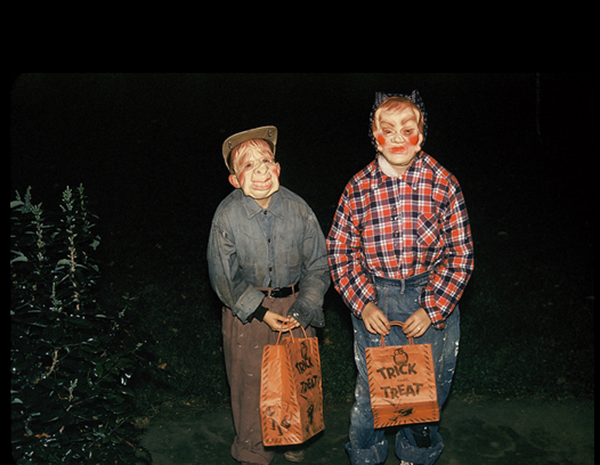 OK, so these guys have the best trick or treat sacks we’ve seen thus far, but I’m taking points away for the mom jeans on ol’ Farmer Rosey Cheeks. Oh sweet fancy moses….I don’t really need to say anything here, do I?? Yikes. 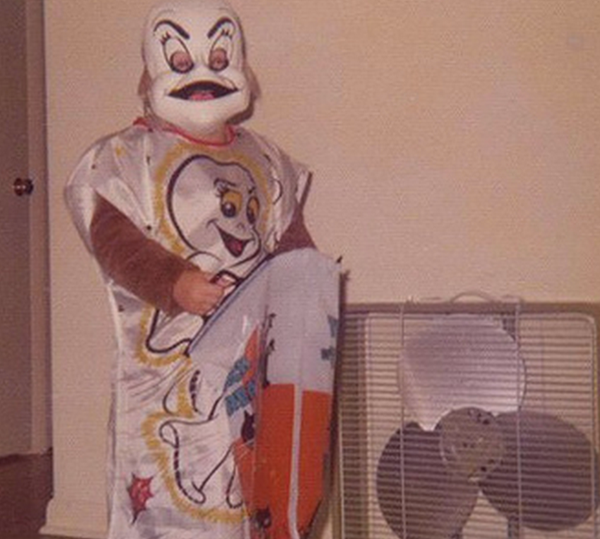 Meet Casper the Friendly-But-Slightly-Maniacal Ghost! I love the double face action here….And those draggy eye brows?? Lets just say I’m a BIG FAN. Hyuck hyuck. Oh bunny. 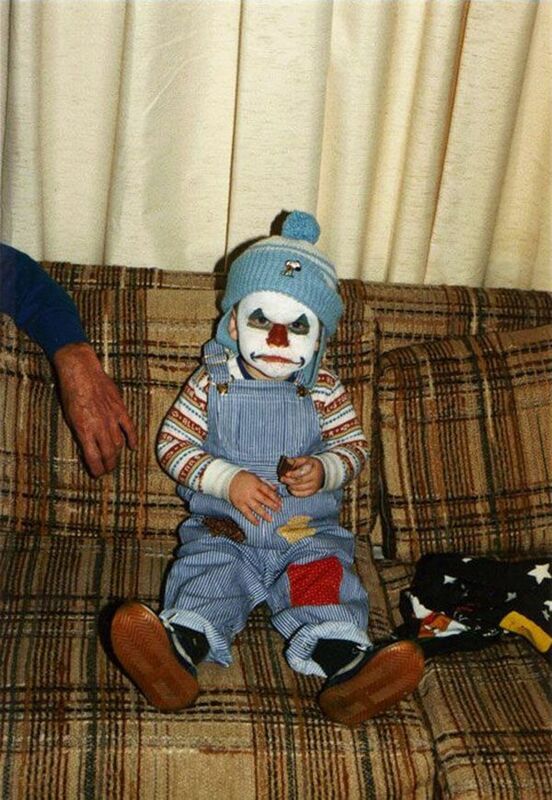 His outfit is straight out of one of our Retro Roundups. His make up is straight up Insane Clown Possee. OK, seriously…..what’s with all these ghost’s eyebrows?? It’s like a master class from RuPaul’s Drag Race. Ironically that witch could do with a good pair of tweezers. And perhaps a slightly LARGER trick or treat bag, hmmm? And finally….this sweet boy. Oh ya darling lil cowpoke, we hear ya….. So there you have it folks, the Halloween Countdown is Officially ON, people!!! Oh my gosh, you cracked me up with these pix & commentary! 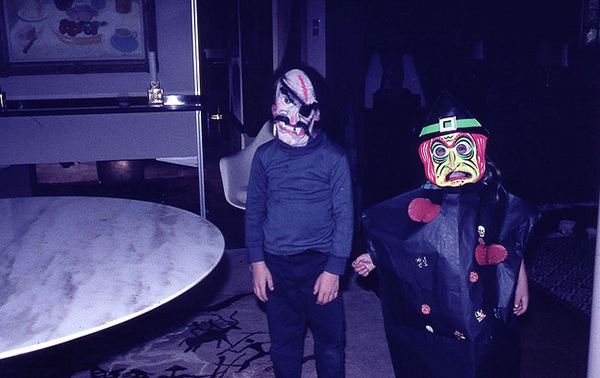 I love those old masks with matching plastic capes… used to buy them at Payless, in the pre-Target days. 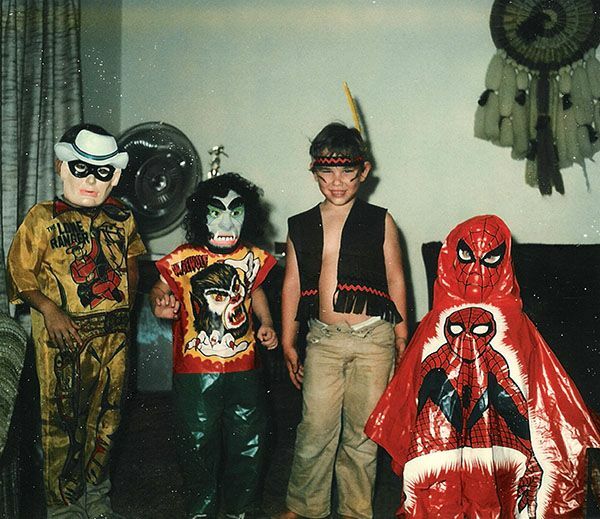 The masks always made your face all sweaty too hahaha! 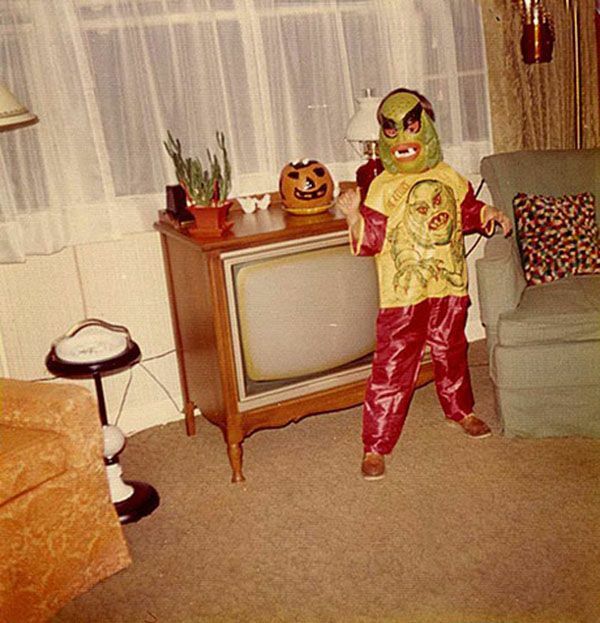 Do you remember what you went as?? 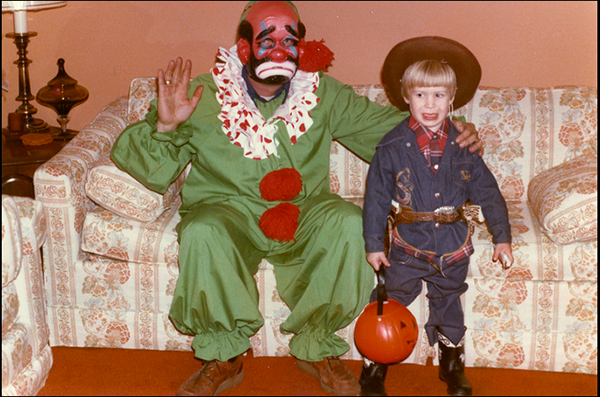 Those were all great but the clown and little girl are seriously going to give me nightmares for weeks! Yikes! Same here!!!! Lucky for that little guy he’s WEARING it and doesn’t have to SEE it!! I am crying. I can’t decide which was funnier – the pics or the commentary. Priceless! Aw thanks Ceri! it was fun to pull together! Found your post through Silver Shoes and Rabbit Holes – sharing with the world NOW …. haha awesome!! thank you Tami….